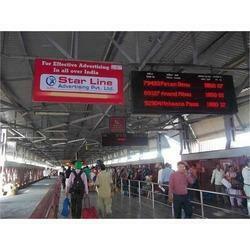 We deals in Railway hoarding advertising more than 100 Railway stations of uttar pradesh and bihar. We offer hoardings and flex board advertising services on railway platform and junctions campus. some of the famous stations listed below for railway advertising in Bihar. We are providing Car Rental services to our clients. We offer pick and drop facility from hotel to railway station. With the immense experience and proficiency in this domain, we are providing our customer Railway Platform Board Advertising Service. A team of adroit executives render these services that are commended and treasured owing to their timeliness and economical pricing. Furthermore, these services are broadly esteemed by our patrons for their flexibility, promptness and affordability. We are a unique entity in the industry, actively committed towards providing an optimum quality Vehicle Branding Service. Assisted by our affluent industry indulgent and proficiency in this arena, we are able to provide Railway Kiosk Advertising Service. Provided services are imparted by adroit personnel who hold vast knowledge in their respective realm that assists them in imparting these services in a well-organized way. Type of Railway Advertising: Railway Platform advertising, Train coach advertising, Railway station premises. We have exclusive rights to conduct BTL activations in most Western Railway Stations. With the help of our expert team members, we have been able to provide an eye-catching range of Train Branding Service.